Home/Blog/The Real Reason You Procrastinate And How to Stop! It’s June 2015. Half the year is nearly gone. Like most people, you probably set some intentions at the start of the year. Let’s check in. How are you doing? Are there goals you have been putting off which now look unrealistic? Or perhaps you could still achieve them, but only if you get going or change tactics now. Maybe you started at some point but got side-tracked as you found yourself drawn to other tasks that promised instant gratification. Take for example, my new Career Coaching client, Jenny. Her new year resolution was to leave her job by the end of the year. Her plan was to step out after bonuses were paid out in April and find that job that would give her a better work-life balance. She knew exactly what needed to be done – research career positions, update CV, network, prepare for interviews, the list goes on… When I met her a couple of weeks ago, she hadn’t started on any of the items on her list and in her words, “I just don’t know if I have the energy to make the change anymore”. Jenny was excited when she set her 2015 intentions but something had changed along the line. So, what’s going on here? Why do we put some things off and not others? Procrastination is often a motivational issue. It is a common challenge that left unaddressed, can derail the best laid plans. 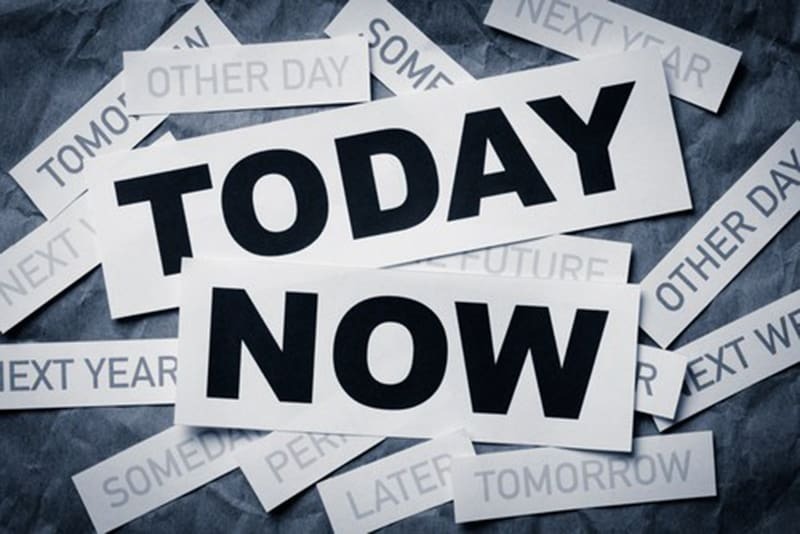 In a study of procrastination by David Gareth and Piers Steel, one of the world’s leading researchers and speakers on the science of motivation and procrastination, they found procrastination to be a consistent predictor of performance. According to Steel, procrastination is an inability to effectively exercise self-control and delay immediate rewards for future benefits. Ever felt that sense of relief that comes with being side-tracked by a juicy conservation when you know you should have your head down working on something that is far less appealing? I have good news AND good news. You are not alone. Procrastination is normal and common. You are not to blame. Your brain is. Neuroscience helps us appreciate what’s going on when we procrastinate. When you first set a goal, particularly one with a distant deadline, your brain is more sensitive to the reward of the goal. Your brain is flooded by the “happy hormone”, dopamine as you visualise achieving that goal. You feel motivated and excited. However, too excitable and you may struggle to focus and get going. As you get closer to the deadline, your focus shifts from the reward to the cost. You start to consider the cost of not achieving your goal. Your stress levels rise and over time, you may experience an amygdala hijack. Remember that fight/flight/freeze response? Not a great space to get creative from. The solution is to work on getting the right balance. A level of stress is essential to get us going, but that needs to be balanced with the right level of motivation. So, how can you stick it out and resist that temptation to stray? We often hear the advice to ‘under-promise and over-deliver’ when managing expectations at work. Apply that to your personal goal setting or task planning. Too high expectations can intensify the fear of failure, resulting in task avoidance. At the planning stage, consider not just the rewards of achieving your goal, explore possible obstacles and build in strategies to overcome them so you feel prepared. Big goals can be daunting and can often result in you looking for large chunks of time to dedicate to them, which we know is hard to find when you have so many conflicting priorities. Bite-size goals are less likely to trigger the fear response and checking items off your to-do-list (however small) fuels motivation to carry on. Giving yourself a pat on the back along the way whatever that may look like for you. It could be the promise of a piece of chocolate at the end of an unappealing task or a phone call to that friend that knows just how to get you in a jolly mood. Rewards along the way help manage stress levels associated with a daunting task. Over the weekend, my daughter asked if she could watch her favourite TV programme after finishing her homework. It made me realise that at 4 years old, she was already inadvertently looking for a reward to focus on as a way to get her motivated to do her homework. Stress often has a bad rep but it is important to recognise that moderate pressure is necessary for optimum stress (which varies from one individual to another) needed for focus and high performance. The key is to have the right balance. How do you fight procrastination? Any additional tips? Procrastination is clearly a complex topic and reasons for procrastinating vary from one individual to another. To fully tackle procrastination, it is important to explore causes of any anxiety that fuels procrastination, and to illuminate and amplify relevant motivating factors to help drive progress. If you or your team is currently struggling to meet key career or business goals, get in touch for an informal chat about how we can help you develop a strategy.